The current track replacement project at the south/west area of the Roncesvalles Yard has reached a point where the new rail installation is about to occur, and as such, TTC track staff will commence a regular night shift as of Sunday, May 1st. This shift involves track crews working from 10:30 pm to 7am. This work associated with the installation of the new rail will be continuous (around-the-clock). Rail installation involves placing the new rail into position, welding and grinding the rail. There will be machinery movement, and equipment used to carry out the installation that can generate noise. Track staff will make a concerted effort to maintain the noisy activities ‎for the day and afternoon shifts. The night shift work will remain in effect until the new rail has been installed on this project. Any questions relating to this project should be directed to Diego Sinagoga at Diego.Sinagoga@ttc.ca . 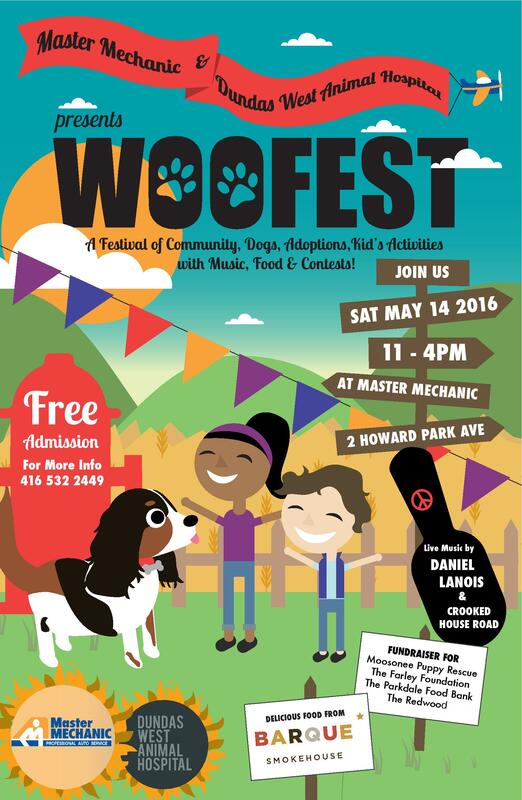 Festival of community and dogs with adoptions, kids’ activities, live music by Daniel Lanois and Crooked House Road, contests and more. Help pollinators and wildlife by growing the plants on which they depend. The sale will take place in front of the Greenhouse (middle of High Park) from 11 am to 2 pm. Cash only. Parking is very limited at the Grenadier Restaurant, so please use transit, walk, or bike if the cherry blossoms are in bloom. Assistance in carrying plants will be provided. In order to have plants for everyone to enjoy, large orders will be available only after 1 pm. This plant sale supports the work of the High Park Volunteer Stewardship Program and native plant restoration in High Park. “The Parkdale Village Business Improvement Area (PVBIA) invites you to Spring into Parkdale Sidewalk Festival on Saturday May 7th, 2016! In 2008 City Council directed staff to undertake an Environmental Assessment (EA) to secure planning approvals for the design and implementation of a local, east-west street north of the railway corridor in the Liberty Village area. The Report will be at Public Works and Infrastructure Committee on Monday, April 25th, 2016. While supplies last, please bring your own shovel and containers. 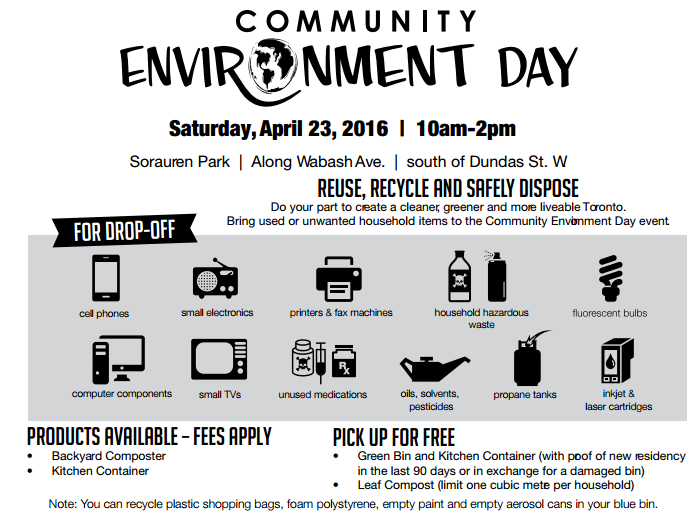 Come out to Sorauren Park along Wabash Ave south of Dundas St W and join in to Reuse, Recycle, and Safely Dispose! Bring used or unwanted electronics, household hazardous waste, fluorescent bulbs, unused medications, batteries, propane tanks, and oils to be safely removed. Please do not bring: construction waste, gasoline, garbage, wood, cassette and video tapes, commercial/industrial hazardous waste and scrap metal. If you require a replacement Green Bin to last until the arrival of the forthcoming new bins can exchange theirs for a reconditioned replacement. • Eyeglasses, walking aids, hearing aids, etc. All donated items must be in very good condition. Leaf compost* (limited to one cubic metre per household) is available for pickup as well. While supplies last.